Saikyo Zuke is a traditional cooking method which initially started in Kyoto where seasonal meat and fish were preserved in Saikyo miso for few days prior to grilling or broiling. 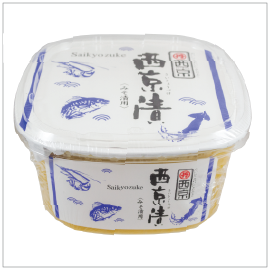 This product, Saikyo Zuke Miso, is a one-step method to easily replicate the traditional taste of delicious Saikyo Zuke dishes. Just marinade your choice of fish such as black cod, sablefish, Japanese seer fish (Sawara), or meats such as chicken, pork belly, or beef tongue for couple days in the refrigerator then grill under medium heat. The refined sweetness and rich amino acid content of the original Saikyo White Miso used as the base for this marinade will penetrate through raw ingredients to enhance their natural flavors.